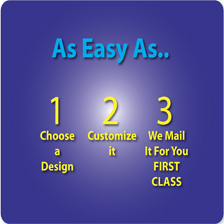 Choose Any Design, Customize it, and We Will Mail it for You. Individual cards are just $2.50 and MAILED FOR FREE! Prices as low as $1.65 for larger quantities. Create your very own Christmas Cards using your family photos or art! Order JUST 1 OR BY THE BOX! Upload your own artwork, photos and graphics to create one-of-a-kind Greeting Cards that are all YOU! Upload your design or image to create unique Greetings, Invitations or Announcements! We print it and mail it for you! ONLY $2.45 postage included! © 2019 All Rights Reserved - Hope Art Inc.